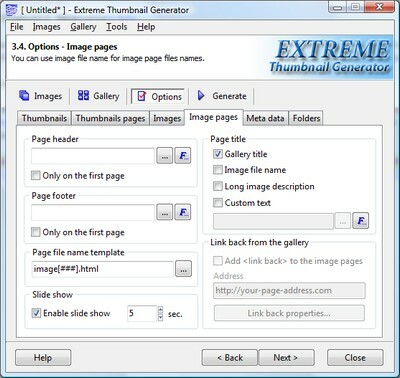 Slide show feature in galleries created with Extreme Thumbnail Generator is available only for image pages. When slide show is on, image pages are shown consecutively, one after another, after a predefined period of time (usually a few seconds). To add a slide show to the gallery you have to open project options and select the Image pages tab. There is a Slide show section where you must check the Enable slide show box and set the timeout (in seconds) in the corresponding edit field.